Here's a very unique and fun event your family will love, Iron Pour at Red Top Mountain! Come see a demonstration of a miniature iron furnace, harking back to the days of iron production in the Allatoona Community. Visitors purchase scratch blocks for $8 each at 2pm. The number of scratch blocks available will be limited, so they will go on a first come first serve basis. Thus, we will be there early. Then we will put our creative juices into effect. Each person that purchases a scratch block will be able to carve out a mold to be used during the iron pour. 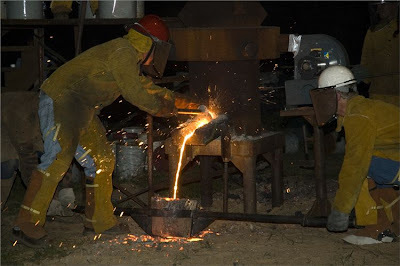 During the iron pour process, the staff will fill your mold with hot iron, and then after it cools, they will break the mold so that your personally designed iron art is released. You get to keep the finished product. Creating the molds is done by both adults and children alike. Though the majority of folks will be adults, even children (when monitored by an adult) can participate. The design you create can be as simple or complex as the person creating it wants it to be. At 6pm, the staff of Red Top Mountain will do the actual iron pour, but you can stick around to watch if you like. You do not have to be there for this part, but it will be awesome to watch. You can get to watch them actually create your own piece of iron art from your very own mold that you created. If you are unable to stay for this part, though, just let the organizer know, and they can pick up your art for you. It can be brought back to Chattanooga for you to make arrangements to get it there. Directions: I-75 Exit 285, go east to State Park on Allatoona Lake. Georgia State ParkPass is $5 per vehicle.